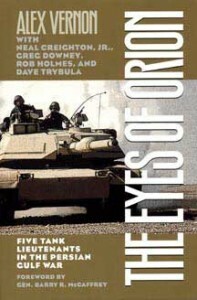 Winner of the Army Historical Foundation Distinguished Book Award, The Eyes of Orion is a highly personal account of the day-to-day experiences of five platoon leaders who served in the same tank battalion in the 24th Infantry Division during Operations Desert Shield and Desert Storm. While professional soldiers and historians will undoubtedly glean much from this narrative, the heart of the account concerns the experiences of the five young lieutenants as they prepared for and served in combat—from their deployment to Saudi Arabia through their six months in the desert training for war, their four days in combat and several weeks of occupation in Iraq, and finally their homecoming. The authors treat their combat experience in Saudi and Kuwait from the perspective of junior officers, all in their twenties and just out of college (four are graduates of West Point and one received his commission through an ROTC program), who served on the front line—facing physical, personal, moral, and leadership challenges. Alex Vernon is assistant professor of English and chair of American Studies at Hendrix College in Conway, Arkansas. He is of most succinctly bred (The Kent State University Press, 2006), editor of Arms and the Self: War, the Military and Autobiographical Writing (The Kent State University State University Press, 2005), and author of Soldiers Once and Still: Ernest Hemingway, James Salter, and Tim O’Brien (2004).